Does your hotel, guest house or historic home struggle to keep up with guests’ Wi-Fi demands? We design fast bespoke quality Wi-Fi solutions for businesses, hotels, campsites, B&Bs, events, offices and large homes in Inverness and across the Highlands. Installing an enhanced scalable wireless solution will speed up your internet for your guests, staff and visitors, and take your network into the future with the opportunity of communicating more to your customers with exciting loyalty marketing services. The byword for Wi-Fi these days isn't coverage but capacity. Imagine you own a campsite or a hotel, and lots of concurrent users are accessing your internet connection, perhaps they're catching up with Doctor Who on iPlayer? Your service needs to have the connection capacity to withstand considerable demand on your bandwidth. No point advertising free Wi-Fi if your customers can't take advantage of it. Our Wi-Fi solutions are aimed at businesses, hotels, campsites, B&Bs, events, offices and large homes, providing fast and inexpensive "wireless bridge infrastructures" designed to span roads, farms, lochs and glens. Whatever your particular circumstances, we always begin with a site survey, also known as an RF survey (RF stands for Radio Frequency). The survey helps us to identify your exact needs so we can design your wireless network properly. With the ever increasing number of swamping Wi-Fi devices, congestion becomes a major issue, and the demand for a stronger, faster connection that provides a larger and more robust capacity is key. Our design will take into account your existing network and future demands. We always recommend solutions that are appropriate and scalable for the future. Are there areas in your property that can't pick up the Wi-Fi? We build tailored indoor wireless networks to suit your building layout and construction; from a small home to a large office, we have solutions to suit. We've been installing an increasing number of outdoor solutions in recent years. Hotels, campsites, B&Bs and outdoor events (like music festivals) want to extend their internet access to the furthest outreaches of their properties. We provide a wireless signal outdoors using high powered Wi-Fi access points that offer larger range and coverage. Point to point wireless network provides a network connection between two locations. Network speeds range from 100Mbps up to 4Gbps. You would use this when connecting two office buildings or replacing expensive fibre or old slow leased lines. Point to multipoint wireless network connects more than one location to one or more central hubs, like a megaphone idea. You can access speeds of 100Mbps up to 4Gbps. Mesh solutions are perfect for large outdoor areas where cabling is not available, like an outside shopping centre or caravan park. The wireless nodes connect scalably and fault tolerantly to other nodes creating one seamless, tough Wi-Fi network. A wireless bridge connects two wired networks together over Wi-Fi. The bridge connects to the internet and passes it onto the connected devices. eg CCTV Farmhouse to livestock barn. Access Points are basically designed to increase system capacity, extend coverage, fill in areas of low or blocked signals caused by obstructions and bridge wirelessly to a remote site. 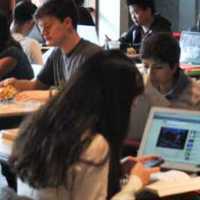 Cheap and are to be avoided if possible, by their nature they halve your good Wi-Fi speed and also cause extra Wi-Fi stress and contention, then they try and send half of it out to users, very problematic. "is your foot traffic going down, are you looking for a digital method to capture your customer information to build a list, and then remarket with email and Facebook Ads to keep your customers loyal. Do you need something new because everything you've tried so far just doesn’t seem to work!" We have partnered with quality Wi-Fi manufacturers who specialise in robustly connecting wirelessly to the internet 24/7. We provide customers with solutions that are appropriate, affordable, effective and efficient. Need proper Wi-Fi? We'll produce a survey report for your property (internal or external) that details your requirements. And if you commission us to install the Wi-Fi system, the report is FREE! My location was not without challenges, the three rental cottages span over a distance of 100m, but by the afternoon there was a perfect signal in each property. DIY Smart Wi-Fi access point, just plug it in (preconfigured), stops users hogging your Wi-Fi by proportioning the "always-on" bandwidth, prevents hacking - secured from your local router or network. Easyily add another AP, scalable and plug and play. Ideal for B&Bs, Guest House, Hotels, Coffee Shops, Campsites and Offices. Everything you need to provide speedy internet access to your guests. 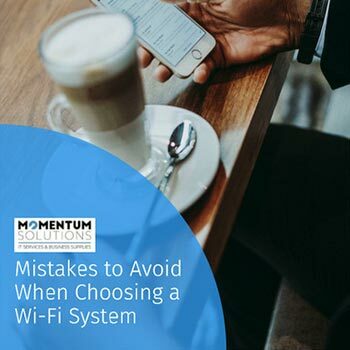 Our Wi-Fi and IT is vital to the business and Momentum provide ongoing support and the peace of mind that if something does go wrong they'll be there to fix it. Make sure you don't make these costly mistakes when choosing your Wi-Fi system. Just enter your details below for your free guide.